Haley’s gone Christmas tree shopping with us every year since she was born. When we bring the tree back home, she waits to grab one of the trimmed branches from the bottom of the tree then prances around the yard like a reindeer with her evergreen trophy before settling down to chew on the branch for a few minutes. It wasn’t until sometime after Christmas last year that I discovered live Christmas trees can cause health issues for some dogs. How did I miss that tidbit of Yuletide knowledge all these years? I knew about poinsettias, mistletoe and holly but I never knew that pine trees are toxic as well. I figured if I didn’t know, maybe some of you hadn’t heard about this either. So, here’s the scoop! 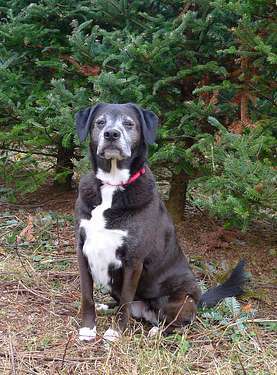 Pine needles can be mildly toxic and could cause a puncture or obstruction in your pup’s digestive system if swallowed. 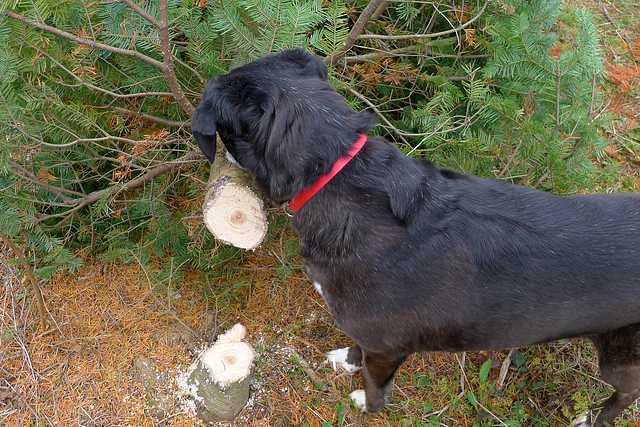 Oil from pine branches can irritate a dog’s mouth and stomach if they chew or ingest parts of the branch. The water reservoir may contain pine oil or pesticides that have leached from the tree and some additives that help keep trees fresh can be harmful if ingested. Electrical lights can be a safety concern for puppies or any dog that likes to chew wires and tinsel or string-type decorations can be harmful if swallowed. 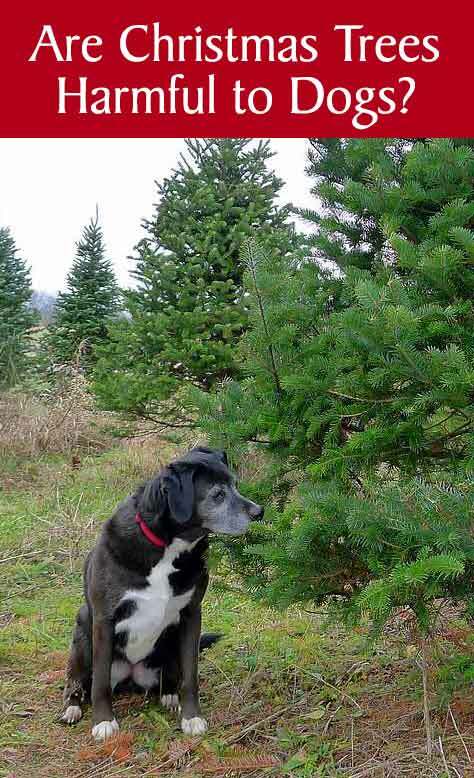 A phenomenon know as Christmas Tree Syndrome affects dogs as well as people and causes an increase in allergy symptoms due to the various molds growing on the tree. While it might be overkill to call live Christmas trees hazardous or harmful for your dog, it’s good to know the facts and be aware that there can be some health issues for certain dogs. I’ve never noticed a problem with Haley after she’s carried the branches around and chewed on them a little bit but maybe she’s a tough dog or I didn’t notice a very minor issue because I was busy decorating the tree. She’s never tried to drink the water or eat any of the lights or ornaments, but many dogs do ingest all sorts of non-edible things. A bigger concern for Haley is the fact that she has allergies and her symptoms have intensified as she’s gotten older. Over the past few years I’ve noticed a slight increase in her allergy symptoms around Christmastime, so as much as I love having a live Christmas tree, next year we might have to consider buying our first artificial tree. If you or your dog have allergies, check out this article on Christmas Tree Syndrome and suggestions for reducing mold spores from live trees. The holidays are such a busy time of the year and it’s not exactly festive to be focusing on safety hazards, but it’s smart to keep a watchful eye on your dog while you celebrate with your family. Whether it’s the tree itself or your pup tearing into a wrapped food gift from under the tree, our pups sometimes get themselves into a little mischief during this time of year. Let’s keep our dogs happy and healthy this holiday season! What do you think? 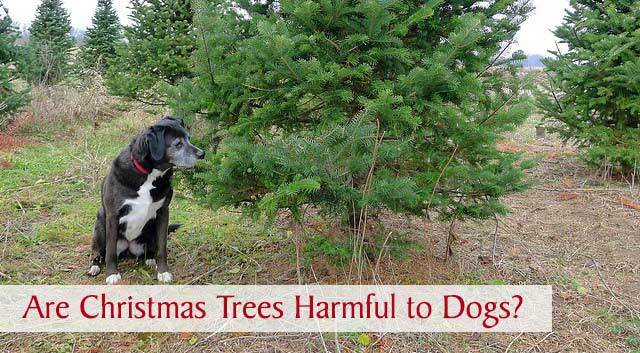 Are Christmas trees harmful to dogs? Are artificial trees safer than live trees? Great information! I have always wondered about the needles and try to keep them swept up. I hadn’t thought about the water! I will definitely keep it covered not so much for Ruby (our dog), but for our cat who drinks ANYTHING and EVERYTHING because of kidney issues. That’s great advice for cat owners too, thanks! When we had our cat, he refused to drink anything but bottled water so I had to laugh at the thought of him drinking the tree water, haha! But seriously, nearly anything can be a hazard in the right circumstances. I guess the idea is to be vigilant like you mentioned–keep an eye on our pups and see if they’re showing signs of problems. When we brought Honey home, I worried that she’d sweep glass balls off the tree with her tail and step on the broken bits. We put our delicate ornaments away and bought things that wouldn’t break. Sorry to hear Haley’s allergies are getting worse. It’s sad to think you’d be missing out on a live tree. Yes, those Golden and Lab tails can clear the bottom of a tree before you know it, haha! We just started Haley on Apoquel for her allergies and so far it’s working great. Maybe we’ll not have to give up on live trees after all (fingers crossed). My dogs have never been interested in the tree except for a few quick sniffs when it first comes in the house. The most damage they have ever done to it was knock a couple decorations off with their wagging tails. So for us a real tree is perfect but maybe for people that have dogs that can’t resist them they are better off with an artificial one. There’s nothing like a live Christmas tree for the holidays! We just put the unbreakable ornaments at the bottom because those happy tails do send ornaments flying across the room, lol! Wow, I had no idea! Good think we use our fake tree every year! Because i’m sure if my huskies smelled a read tree in the house, they would be all over it! You would probably find them all curled up together under the tree, lol! ? Thank you for sharing this important information that I bet most people wouldn’t even think of. Thanks, JoAnn! Our vet mentioned last year that they see a lot of dogs around and right after Christmas for allergy issues from live trees. I guess Haley’s not the only one. Timely post (for me that is). I promised my adult daughter once we moved to SC I would stop using fake trees. This will be Jaxson’s first Christmas and we’re getting a live tree. I will make sure to watch him super carefully. That’s awesome! Jax will surely be intrigued when you drag the tree inside the house. Harley and Jaxson will look beautiful in a photo around the tree. ? Wow….was not aware of these hazards. Thanks for the tips. Thank you, Michele. ? Thanks for stopping by today to check out the blog! It’s such a common allergen for dogs. Anytime we travel to North Carolina or other states with a lot of pine trees, Haley’s allergies flair up too. Sad to say but with cats and dogs I actually stopped putting up a Christmas tree. With the cats, of course no glass decorations they would knock them down. I only had a real tree for a couple of years and used artificial after that. Then, for the finale I actually hung my tree from the ceiling, because I was tired of re-decorating it everyday after I got home from work. Either the pups or the cats would knock it down daily. Now, a nice little centerpiece tree on my dining room table will do for me. I’ve heard of people hanging the tree from the ceiling, but I think I would go for the table top tree myself too. There’s enough to do around the holidays without redecorating a tree everyday. ? The dogs are very distressed that the new fake tree isn’t as wide as the old. They miss the old hiding places. Good info on live trees. Aw, maybe you can stack some presents around in a way that creates some new hiding spots for them. I imagine finding the perfect artificial tree is just as challenging as finding the perfect live tree. Great post – I bet not many folks think about how this tree in the house might impact their dog. Good heads-up. Thanks, Slimdoggy! I was surprised too when I heard the oil from the tree was somewhat toxic and then realized that Haley had been chewing on them for years. Luckily, she never had any issues that we noticed. I use a very small, porcelain tree from the 1950s for my household decoration. I can use it year after year after year, with no worries about cat or dog health hazards or fire issues. Everyone wins! My parents have one of those small, ceramic trees too and haven’t had a large tree for many years. It’s just as special to them and it’s become part of their Christmas tradition. I like seeing it when we visit because I used to play with the removable lights when I was little and my youngest son did the same thing when he was a child. I’m sure we both lost a few of the bulbs along the way, lol! We have not had a real Christmas tree in so long. I have several artificial ones and we either put up one of the big trees or a small one. This year we went small, but be warned, those little needles get EVERYWHERE! LOL! I’ve heard that about the needles and pups that like to eat random things would probably munch on a few of those too. Thanks for sharing this information. There so much to worry about for our dogs this time of year with foods they shouldn’t eat, electrical lights, the trees…..oh my! Yes and one of the things that happen around here is, because we’re so busy getting ready and then company arrives, it’s harder to always keep a watchful eye on the dog. It puts our multi-tasking skills to the test, haha! I would love to have a real tree but know that with Cocoa we probably should not get one. She puts everything in her mouth and loves to chew things. And she is so active and our house is small!! I want to keep her safe and happy. I do love a real tree. That might be a smart idea for this year, haha! I’m sure Cocoa will settle down a little bit with age though and you’ll be able to have a tree one year soon. ? Wow, thanks for the warning about pine trees! I hadn’t thought about the tree sap & other potential hazards. We always have a live tree but the dogs don’t try to chew it. Maybe restrict your live tree to the front porch to prevent your dog from chewing the branches? That’s an interesting idea, Cathy. I’ve heard of other people putting their live trees on the front porch. Maybe that’s a good compromise for dogs with allergies too. I did some research on artificial trees last season, and found out that most artificial christmas trees come from China, and therefore contain a ton of iffy components, particularly hazardous lead which can cause a lot of trouble if ingested. If we do look into an artificial tree next year, I think I’ll check out the trees from Balsam Hill.